IHOP's annual National Pancake Day is back with a sweet deal. 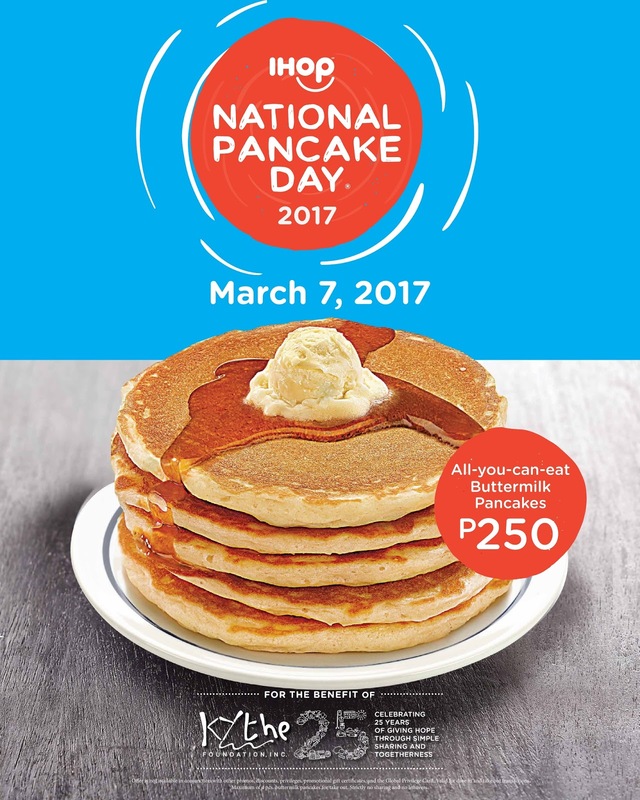 On March 7, 2017 all IHOP® restaurants in the Philippines will once again join locations throughout the United States, Canada, Puerto Rico, Guam and Mexico in celebrating a unique and beloved IHOP restaurant tradition: National Pancake Day. From 7 AM to 10PM on Tuesday, March 7th, all 5 IHOP locations will be offering guests the opportunity to enjoy unlimited servings of their world famous buttermilk pancakes for only P250, to enjoy in the restaurant. P 200 out of the P 250 generated from those pancakes will once again be donated to the Kythe Foundation, which provides children with cancer and chronic illnesses the chance to learn, play, and grow while in treatment, even if they’re in the hospital. National Pancake Day began in the United States in 2006 and in the past decade has raised $20 million dollars for children’s health charities in the local communities. Last year, IHOP Philippines joined the celebration, raising nearly P400,000 for the local Kythe Foundation charity. I attended this year's launch of National Pancake Day at IHOP Philipine's flagship store in Bonifacio Global City last Tuesday. Even though I am so sleepy from my shift the earlier night, I couldn't miss this especially after knowing that this event was for a very good cause. And I wanted to be a part of something so humbling even by just helping to spread the news. Honestly, it was my first time to visit IHOP, I've been meaning to for quite a while but just didn't have the chance to. My best friends who lives in the States love IHOP and it's one of their favorite stores. They told me stories of how good the pancakes and how big the servings are. The BGC branch of IHOP is a 2 floor restaurant with glass walls from ceiling to floor which lets natural light to come in. The place is is with a very cozy and relaxed atmosphere. Their menu consists of all-day breakfast, American comfort food and they have also incorporated some well-loved Filipino dishes. We got to taste some of their menu items, and of course also their famous and all-time favorite Buttermilk Pancakes that will be the highlight of this year's National Pancake Day. Original Buttermilk Pancakes - IHOP's world-famous buttermilk pancakes that comes in 2-stack or 4-stacks. This comes with 4 types of syrup that are already available on each table: Old-Fashioned, Strawberry, Pecan Butter and Blueberry. Their pancakes are fluffy and tastes milky and buttery. I like my pancakes swimming in syrup and I like that IHOP is giving me 4 choices. My favorite among the syrup is Blueberry. Sausage, Spinach and Poached Egg Fettuccine - creamy pasta dish that still feels like breakfast. I was surprised with the combination of sausage, spinach and poached egg, yet everything tastes great and well-balanced. The poached egg made the sauce creamier. Shredded Beef Tapa with Egg - the well-loved and classic Filipino style marinated beef, shrreded and served with garlic rice and eggs. The beef was tender with a balanced sweet and sour taste, definitely in-linme with the Filipino palate. You can have your eggs cooked the way you want it, sunny-side up or scrambled. Come and let's all join in Spreading Happiness with the rest of the world on March 7, 2017 for National Pancake Day and fill our tummies with Pancakes With Purpose! All IHOP Philippines branches from 7:00 am to 10:00 pm will offer All You Can Eat Pancakes for only P250. P200 of the proceeds will go to Kythe Foundation to aid in their mission of battling pediatric cancer in the country. This will be the 3rd Annual National Pancake Day for IHOP Philippines and incidentally, the Kythe Foundation is also celebrating their 25th Anniversary this year. The P250 includes the unlimited buttermilk pancakes with a choice of IHOP’s signature syrups and whipped butter. It does not include drinks and other pancake flavors. However, you are free to order from the menu should you wish different fare.